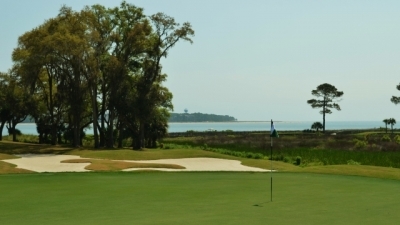 DAUFUSKIE ISLAND, SC – Haig Point Club is one of those “know it when you see it” types of places. Sometimes you just know something’s going to be great from a first glance. You see Disneyland? You know it’s going to be fun. You see the Capitol in Washington D.C.? You know it’s going to be impressive. 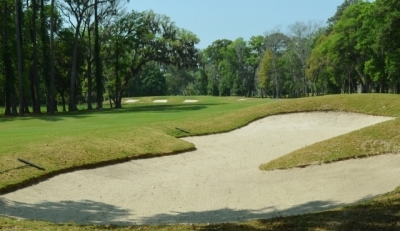 Jones is renowned for incorporating the best features of the site with the golf course. No place demonstrates this better than the par five 4th hole, with a beautiful backdrop of trees. That was the type of feeling that Haig Point Club provided. 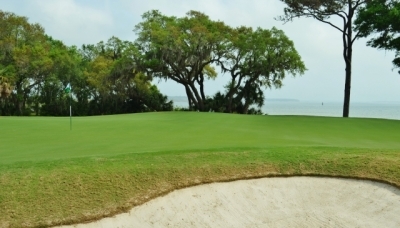 When we saw the Rees Jones-designed masterpiece in a setting as natural and beautiful as Daufuskie Island, South Carolina, we just knew it would be hard to beat. Even the ferry ride over to the club provides a real sense of serenity – just an all-around terrific experience. International Paper even used the trees that were harvested from the site – barged them off the island – because they were so valuable. The tree on the right side of the photo comes very much into play on the approach shot to the par four 12th hole. 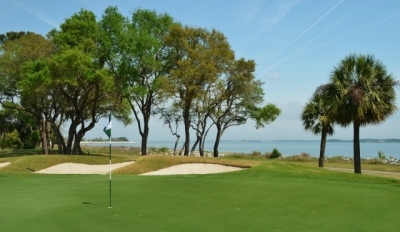 Haig Point is on the north end of Daufuskie Island, across the Calibogue Sound from another famous landmark of the area – Harbour Town on Hilton Head Island. Both spots are beautiful and scenic, yet Haig Point’s isolation adds privacy to the equation. It’s a nearly perfect location for the club’s members and their guests. The island’s history contributes to the overall quality. According to Haig Club’s Director of Golf, Jason Cherry, a man named George Haig I bought the property in 1735 from one Archibald Niele. Upon Haig I’s death in 1790, the land descended to George Haig III. Haig III subsequently sold it in 1810. Rees Jones says the 8th hole is one of the best par threes in the world. We agree. And although the Haigs were no longer owners, the property kept their name. Maybe if they’d known how the land would eventually be used, they wouldn’t have sold. Oddly enough, Haig Point’s most impressive structure isn’t native to the island. The Strachan Mansion was acquired by International Paper, which had it moved from St. Simons Island (the home of Sea Island Resort) in 1986. There’s also a famous 19th century lighthouse on property, which now serves as Haig Point’s symbol and doubles as a rental property for members and wedding guests. As for the 21st century, Haig Point Club is about golf. 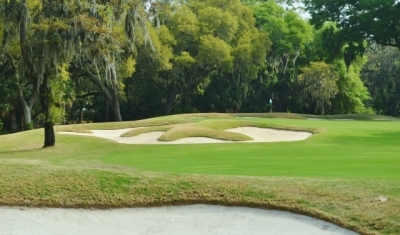 The club’s uniqueness is tied to its special place on the map, but also because the layout has 20 golf holes. That’s right – twenty. 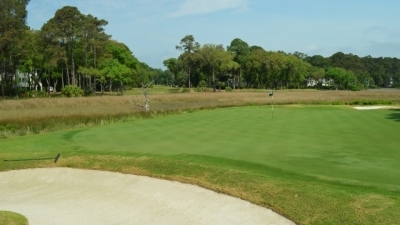 In addition, there are essentially two golf course set-ups, with the Calibogue course containing all the forced carries over the marsh, and the Haig Point course offering the same golf holes without the carries. It is not clear from this view, but the green of the par five 14th hole is on a narrow peninsula. Big numbers await those who miss it. The extra holes were necessitated by the salt marsh. The par three 8th and 17th holes both have two golf holes. 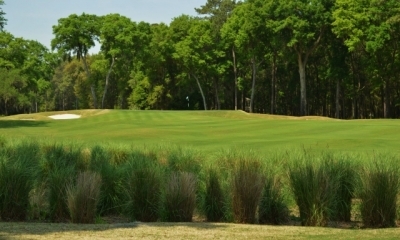 The Haig Point versions are more of a “standard” par three, and the Calibogue versions demand rather lengthy carries over a marsh. At 450-yards, the dogleg left sixth hole is the longest par four on the front nine. Sound confusing? It really isn’t. Just follow the signs and you won’t end up in the wrong place. Trust me. The last of a world-class set of par threes -- the 17th hole. 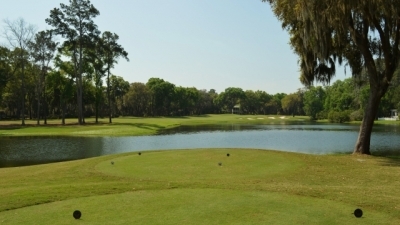 The third hole is certainly one you won’t forget. It isn’t everyday that you’re playing golf down a corridor containing those magnificent trees. Don’t be too surprised to see Scarlett O’Hara surveying the land… okay, maybe not. Haig Point’s trees are hearty, too. Jones said there was a tornado that touched down during construction, taking out some of the weaker trees and leaving the par four 6th hole a good deal wider than most others on the course. “The tornado also went down the fifth hole (par three) a little bit. Tornados often ‘jump,’ and it hit part of the first hole and the practice fairway as well. The big oak tree on the fifth hole got really hammered, but you wouldn’t know it now, all these years later,” Jones remembered. 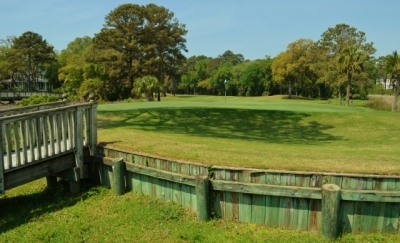 The ninth hole is a par five from the Calibogue tees, and a par four from the Haig Point tees. Not because of tornados but because of the need to allow for better maintenance, the Jones team went in and did some renovation work in 2005. They restored the green contours that had been lost over the years and re-grassed the course as well as redoing the bunkers. One thing they didn’t have to change was the scenery. It can’t exactly be said that scenery improves with age, but since the course opened in 1986, it’s still just as brilliant. The view from the tee of the par four 10th hole is.... Daunting. All of this, and the quality of the golf experience shouldn’t be overlooked. Haig Point is made more difficult from the somewhat narrow corridors, but it’s also an extremely fair golf course. The par three 5th would be a relatively unassuming hole but for the presence of Calibogue sound in back of it. One other aspect of the player-friendly nature of Haig Point is the lack of automobile traffic – which is rare on a golf course that’s part of a development. Now, cars don’t normally get in the way of golf, but because there are no bridges to the island, nearly everyone gets around by golf cart (or various human powered alternatives). “With no car traffic interruptions, golfers enjoy a peaceful round amongst nature and they can play from wherever their ball ends up as we have no out of bounds at Haig Point,” Cherry commented. 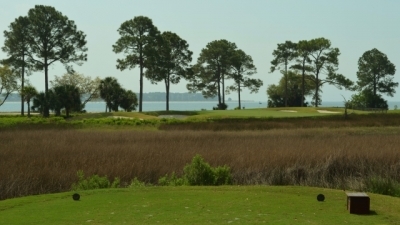 If you’re fortunate enough to be invited to play at Haig Point, your full-sized four-wheeled friend will have to wait over on Hilton Head Island, but I promise you won’t miss it. The tee shot on the par three 15th hole heads back towards the land side, but you will still have to clear the marsh. 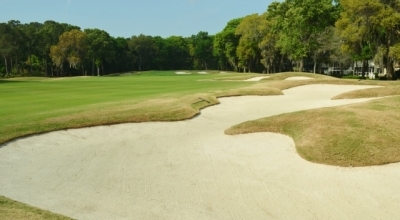 Hole highlights certainly include the aforementioned eighth and seventeenth holes on the Calibogue course. Both are shots over the marsh with little or no bailout short. You either make it or you don’t! The seventeenth hole’s target is wider, and the tees are a little elevated – which makes it a slightly easier shot. We also enjoyed the mammoth 615-yard, par five fourth hole. It seems to go on forever, and really makes you think of the best way to play your lay-up shot (there are a couple bunkers that squeeze the landing area). But what is perhaps most memorable about the hole is the beautiful oak backdrop – the beauty of Haig Point summed up in one scene. The view is slightly less intimidating from the back of the green of the 8th hole. The par three fifteenth hole also crosses the marsh from the back tees… but it’s shooting towards the land side. 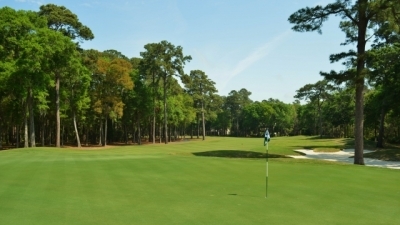 At 200-yards from the Calibogue tees, it’s a tough shot – though not quite as deadly if you’re short. The round concludes with a 510-yard par five, reachable in two if you get a good drive. The final approach shot of the day, from the fairway of the par five 18th hole. Also noteworthy was the club’s wonderful hospitality. The staff treated us like members and even took time to assist the non-golf playing folks in our party. Kudos to Cherry for running a very tight ship. Haig Point is a Private member owned equity club that is accessible by being a guest of a member or sponsored by a member. The club does host members of other Private clubs by setting up a reciprocal with their home club Director of Golf to allow them access for play. Check the website for special event opportunities at Haig Point.